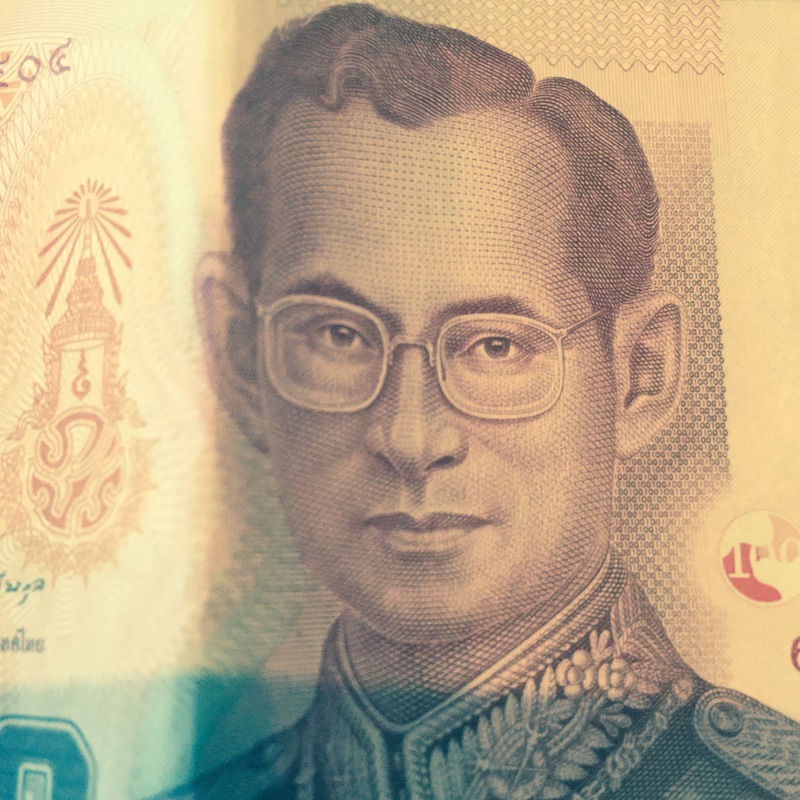 I recently bought a home in Thailand where I hope to spend many future winters and last week was the King of Thailand’s 86th birthday. Despite making multiple visits to Thailand in the last 9 years this was the first time I had been here on his birthday and able to watch the extraordinary scenes of affection as the annual celebrations unfolded. 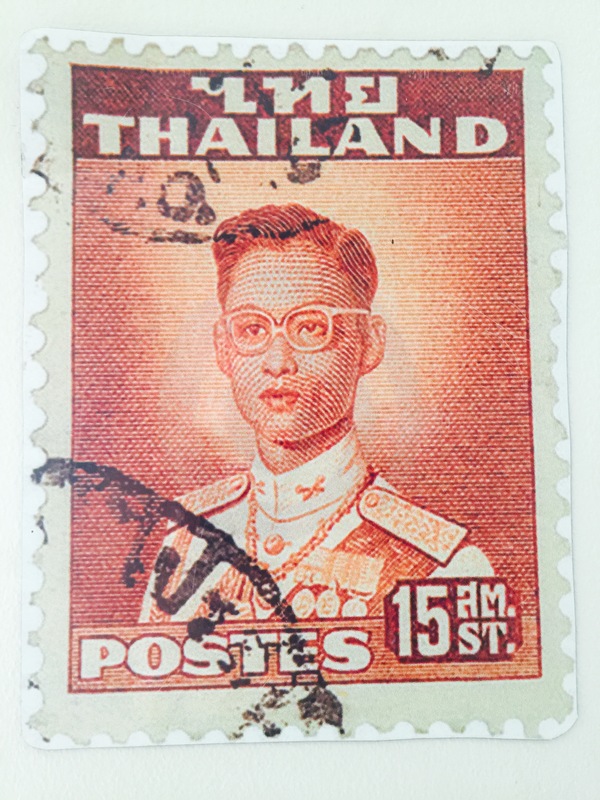 King Bhumibol ascended to the throne in June 1946 which makes him the world’s longest serving Head of State by some distance after 68 years on the throne. However what is even more impressive is the unbridled love and affection that the entire country affords to him. In the UK our own Queen is certainly respected by the majority of the population for her decades of unswerving dedication and devotion to duty and many Brits will also add affection to their respect. 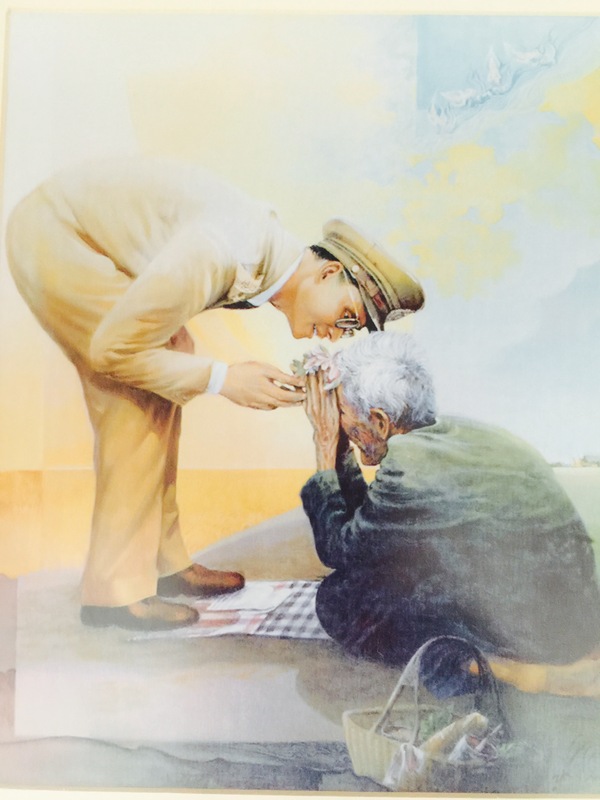 However the genuine love of the Thai people to their King is on a completely different level. The only way I can describe it would be to imagine the love and affection you might have for your own mother or children and then have that transmitted by 60 million people to their King who is perhaps best described as a figure of reverence comparable to Nelson Mandela, Mother Theresa and Muhammad Ali – combined! I had stayed up through the night to watch Arsenal unsuccessfully attempt to win their Champions League group at Napoli (all Champions League and Premiership soccer games are shown live on Thai TV) and was looking forward to a long lie in forgetting my Thai builders were due at 9am for their 3rd attempt at identifying a leak that was sending water down the outside of the house. Consequently I was woken by high pressure power drill banging away just a few feet from my bed as the builders removed tiles from the wall of my nearby bathroom. I went downstairs barely compos mentis to find some Thai guests watching the TV. I should perhaps comment that I have noticed most Asian women appear to have been born with a remote control in their hand – the exceptions being the Chinese and Filipinos whose hands were already wrapped around a cell phone! I quickly remembered it was the Kings Birthday. I remained glued to the TV for the next couple of hours listening to the optional commentary in English so visitors could understand what was going on. The scenes were from the coastal resort of Hua Hin a few hours south of Bangkok and where the king now resides and initially showed a long motorcade making its way slowly through the city with the crowds, several people deep on each side of the road and mostly sporting Yellow Shirts, cheering and smiling. Many were visibly overcome and in tears. Clearly these were not crowds bussed in to make up the numbers but people genuinely pleased and happy that their King was with them. It was so moving to watch that I soon had tears welling in my eyes and running down my face just watching! Anyone spending time in Thailand is aware that the King is very much considered to be ‘the Father of the Nation’ but I have never ever seen such visible outpouring of affection for any individual – even when Nelson Mandela was released from prison is 1990 which I remember watching live on TV. Eventually the motorcade arrived at the ceremonial Meeting Hall where it appeared at least a thousand beautifully regaled Thai dignitaries were waiting and the King was wheeled to a throne where he was seated to receive a number of lengthy tributes from first his son the Crown Prince Maha Vajiralongkorn, the Prime Ministor Yingluck Shinawatra (more of these two characters later!) and the Leader of the Senate as well as the Oath of Allegiance from the Supreme Commander of the Armed Forces. And through all this the King sat impassively on his throne – not a flicker of an eyelid, not a response and not a smile but then these days (as one of his few biographers titled his book) ‘The King never smiles’. Quite clearly he is not a natural extrovert but someone who appears shy and reserved by nature but any examination of his reign shows he quite clearly had the common touch in being able to reach out and relate to his people. Whenever one goes to the cinema in Thailand the National Anthem is played and everyone stands reverently whilst a short two minute clip is played with an overview of the Kings career and reign and often with him visiting rural areas or working on irrigation or rain making projects with the peasantry. It is clear he has always tried to stay in close touch with his people and how he has earnt their love and respect .These productions are kept simple, well edited and changed by a clearly very skilful and experienced Palace PR team every three or four months. I try and get to the movies at least once a week and if for any reason I am running late I am disappointed if I miss the Anthem and film and even if I have watched it several times previously can still bring tears to my eyes! 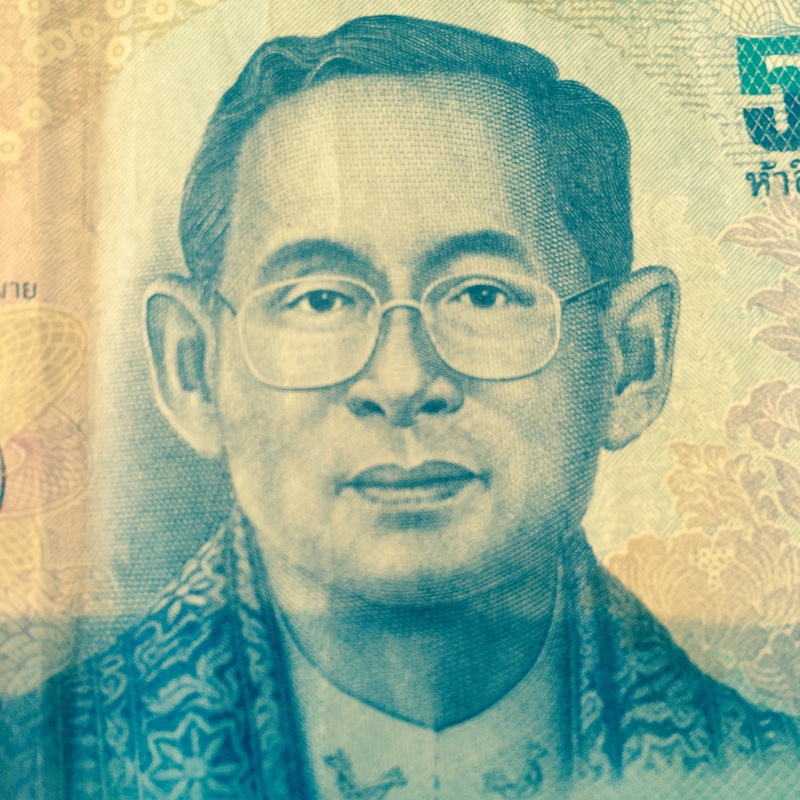 There is no sense of it being a ‘personality cult’ but every town in Thailand has pictures of the King prominently displayed on bridges above roads, at intersections and on public and private buildings. Every business will have an image of the King on prominent display near the Reception, every household will contain an image of the King and every market will have stalls selling inexpensive images of the King. And these pictures will invariably be of every stage of his life from newly married, dressed as a monk, involved in public works, attending his 60 year reign celebrations right up to the current day in a wheelchair. In the UK I never once thought of having an image of the Queen on display in my home, in Thailand I would never consider not having a picture of the King on display in my house! Indeed I recently purchased an image of him almost doubled up in bending down to acknowledge the tribute from a peasant woman at his feet. The king is an interesting character who in his youth was an accomplished Jazz saxophonist, an enthusiastic photographer , an accomplished sailor and a respected authority on irrigation and artificial rain making as well as being hands on involved in many public works in Thailand. He is a constitutional monarch in that his governments make all the decisions regarding how Thailand is governed yet his status is such that it is a crime to make any public criticism or even inferred criticism of the monarchy (lese majeste) and although the King has publicly stated he welcomes criticism governments to this day will arrest people accused or criticising and undermining the royal family although they are usually, but not always pardoned. For years there has been concerns about the King’s health as he has been in and out of hospital many times and as I watched the TV I had to wonder how much of this he was taking in and whether he was being wheeled in and out as little more than a revered icon in a vegetative state but in fact it seemed this was an example of his iron will and fortitude rather than being in a semi vegetative state as incredibly at the end of the tributes he in turn responded by reading an annual message to his people! At times it was almost painful to listen as his frail voice struggled to get some words out – indeed some pauses were as long as 15 seconds and at times I felt both sorry for him and full of admiration for his efforts and the entire audience were silent, respectful and still until he finally reached the end. His four children then left the podium to await by the door of the elevator on the floor below to bow to him as he was pushed to his car and driven back amidst the cheering crowds to the Palace. The only missing member of the royal family was the Queen who has not appeared in public since suffering a stroke 18 months ago. In the historical sense there is little doubt that Britain is a nation in decline from our once unquestioned role as a global power but if there is one area where we Brits like to think we can still match anyone in the world it is our ability to organise ceremonies, pomp and pageantry. However I have to say the Thai’s put on a pretty impressive show replete with gun salutes, bands playing, slow and respectful renditions of the beautiful national anthem, naval vessels off shore, mounted cavalry and impeccably attired personnel and troops. It was all quite a spectacle with the second stage of the annual day of celebrations to be in the evening where every town and city in Thailand had a candle lighting ceremony to pay tribute to the King. In Pattaya where I live two of the main streets were closed so the ceremony can take place along Beach Road and on TV that evening I watched the main Ceremony in Bangkok outside the Royal Palace led by the Prime Minister Yingluck Shinawatra as well as the highlights of the various ceremonies in from many of the leading cities in Thailand. It was a day when if the country did not come a stop at least everything was subservient to and dominated by celebrations to mark the King’s Birthday and that included the current movement to topple the government! The political situation in Thailand is at best complex and there is currently a sustained and well organised movement of protest calling on the legally elected government led by Yingluck Shinawatra to resign – government buildings have been occupied and there have been a few deaths but the leader of the Protest movement, Suthep Thaugsuban, called on the protestors to suspend all action and confrontation with the authorities. (‘The revolution can continue tomorrow everyone – we can’t be disrespectful to the King today’) which is a reflection of the high esteem and importance in which he the King is held. No party or movement with any hopes of credibility would wish to be perceived as being disrespectful to the King although he has no actual powers. At present there is a never-ending standoff between the movement wanting change, largely based on the educated and professional middle classes of Bangkok and the bigger cities, wanting a more democratic system, less corruption and less influence from the Shinawatra family and the rural peasantry. The problem is the free electoral process continually results in the rural vote delivering power to the ‘wrong’ people. This is a real conundrum and the latest twist after three generally peaceful years following the Bangkok protests and fighting in 2010( which resulted in almost 100 deaths) is that the protest movement has not been calling for elections (because they know the electoral process will re-elect the government) but for the government to be replaced by a nominated council of the good and great which is a novel twist – lets replace the democratically elected government by real democrats who are not elected! But this being Thailand the situation is not quite as clear as that. Does this change the results – probably not and without a doubt money is paid to many of the protesters bussed into Bangkok both to support the government and oppose it. I have a friend who has confirmed if she is in her village at election time anything between 1 and 5 parties will give her between £4 and £10 as a ‘gift’ to vote for their candidate and she takes anything offered for her family and nonetheless votes for whoever she wants. And what has contributed to most rural voters support of the legacy of Shinawatra is the memory of his populist policies when a lot of financial aid was given to all the villages and indeed what has triggered the current wave of protests is the name Shinawatra – this time his attractive younger sister Yingluck Shinawatra the current Prime Minister who played a prominent role in yesterday’s celebrations. Although Yingluck had no political experience she was chosen by the Peoples Party to be their Prime Ministerial candidate in 2010 knowing well that the name Shinawatra was a vote winner – indeed it is widely believed she was nominated by her brother living in exile and it is generally considered she has done a reasonable job as PM and despite many travels overseas (to see her brother?) her soft style and consultative leadership has been fairly well received by the country, not least during the current protests. However the catalyst for the recent protests was a proposed amnesty bill which her opponents saw as paving the way for her brothers return. This was the first serious misstep Yingluck had made in the last three years and although the proposed bill was rejected by the upper house it was sufficient to give her opponents grounds to resurrect their campaign of street protests calling for her resignation on the grounds she is under the influence of her brother living in exile rather than returning home to face corruption charges. This of course raises another interesting point as almost all the Democratically elected leaders in the western world take advice from non-elected advisors – In Yingluck’s case it is assumed that despite being seen as increasingly independent of her brother’s wishes with her own set of advisors she is still influenced by an outside advisor that the Educated classes of Thai society despise. The opposition movement is led by a former deputy Prime Minister Suthep Thaugsuban seen by many as an opportunist hungry for power who is hoping he can develop a movement powerful enough to force the army to depose Yingluck just as they did her brother after months of protests in 2006. Suthep is hoping to replace Yingluck’s government with an unelected ruling council of grandees which is widely seen as simplistic and unworkable long term. Indeed many see the protest movement as being manipulated and hijacked by the traditional power brokers in Thailand in an attempt to regain the authority and influence that they have lost to Shinawatra’s and their supporters in the past decade. Yingluck’s stance has been to say ‘respect the system if you do not respect me’ and within days of this article being drafted announced the resignation of the government and called for new elections in February – meanwhile she will stay on as ‘caretaker’ Prime Minister. Of course the protesters do not want new elections as they know they cannot win because the one person one vote system does not deliver the results they want! It is a unique situation when the protesting forces allegedly wanting a more accountable government do not want to abide with the results of democratic elections and the reality is it is the urban elite and establishment verses the rural masses and if the long term future of Thailand is difficult to predict at any time (the army have deposed the government countless times in the last 40 years but always yielding power back to the electoral system) it is now complicated by the king’s age and ill health as his likely successor the Crown Prince Vajiralongkorn. 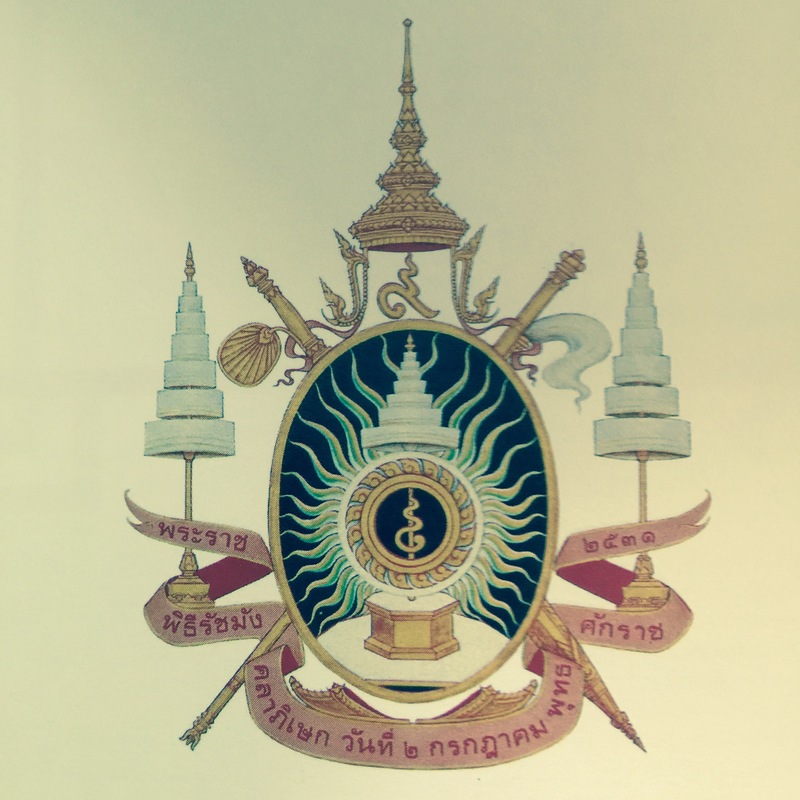 Whilst it is obvious that no successor is possibly going to match the stature of the beloved King, Prince Vajiralongkorn 61, who like Prince Charles has spent almost his entire adult life in waiting, is not well and although discussion of his private life is forbidden by the laws of lese majeste, as well as having had three wives and a number of girlfriends (some of whom are alleged to have disappeared) he has generally lived a wild life that included gambling debts allegedly underwritten by Taksin Shinawatra with whom he is believed to have close ties. All the elements are in place for a potentially inflammatory situation when the King passes on and so it is little wonder the King has maintained a somber expression and rarely smiled these last ten years! Thailand is indeed a land of contrasts – parts as modern, sophisticated, high tech and urbane as anywhere in the western world and parts third world where peasants will work 12 hours in the fields as subsistence farmers. My then 18 year old son once commented ‘this country should decide on which identity it wants to pursue’. Thailand is a land where many westerners choose to live, work and retire enjoying the equable climate, low cost of living and the delights of living in the East which for many men include an attractive, loyal and supportive Thai partner – sometimes male, sometimes female and sometimes ‘lady’s of the second type’ (ladyboys) as three genders are officially recognised in Thailand!. However sometimes old Eastern habits die hard and like the King my friend Peter is (barely) walking around Pattaya without much of a smile on his face these days. Peter has a fairly high profile in Pattaya because of his work and I am going to protect his identity by using an alias and not his real name. He has lived in Pattaya for the best part of 10 years being originally from the north of England and has been married to his Thai wife for 5 years. He is a pleasant and congenial individual but almost a compulsive philanderer, a fact apparently known to everyone except his wife who believed him to be working late all those evenings when he was enjoying alternative company and pursuits. ‘Well I have a bit of a problem there’ he said almost inadvertently feeling his groin. Apparently he had recently gone out for an evening with the boys and come home rather worse for wear and considered he had done well to get into bed without waking his wife and was pleasantly surprised to find within minutes that rather than criticise his condition his wife was making amorous advances and he was feeling very aroused as her head and his nether regions were getting well acquainted. What produced instant sobriety was the sight of a large kitchen knife in one hand that she had hidden under the pillow (this gives an entire new connotation to the term ‘pillow talk’!) and which was primed to descend and separate the offending member from its owner. In a split second Peter was instantly awake and instead of removing the aforementioned proud and erect member the knife slashed along Peter’s groin and inner thigh. With blood everywhere he disarmed his ‘crazy’ wife who had gone through his contacts list when he left his mobile phone at home and called an ambulance to take him to hospital for 10 stitches along his inner thigh. Peter and his wife were now at least talking again two months later but no relationship is going to survive that attack and Peter can now gallivant at will and in truth even if his wife had succeeded in the amputation all might not have been lost as the Thai surgeons are the world’s leaders in restoring castrated parts back to their rightful owners as long as the member is kept intact! Each year the Thai newspapers report of such castration attacks where the offending member is fed to birds or fish or floated down the river in a match box and in these situations no surgeon is going to make a silk purse out of a Sows ear if the ear cannot be found or has already been consumed by the circle of life. I have just spent two months furnishing and decorating my new home in Pratumnak which is part of Pattaya but very quiet as I am near the Palace belonging to the Crown Prince’s first wife who lives at the end of my road. At times it was a very frustrating experience to buy furniture etc and the entire undertaking replete with misunderstandings between buyer and seller just as Thailand is a nation of many attractions and multiple contradictions – and castrations! Thailand is known as ‘the land of smiles’ where people are openly friendly and usually greet visitors with a smile – but throughout all the celebrations not once did the proud but frail King crack a smile despite being surrounded by waves of love and affection ………………………..and for unrelated but obvious reasons my friend Peter is not smiling much these days either! 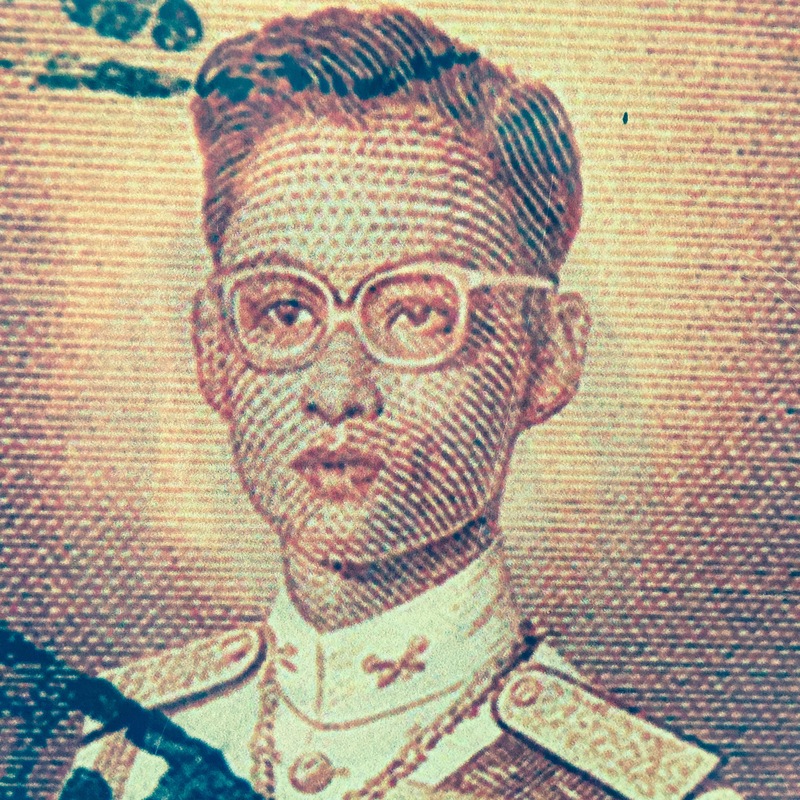 Categories: Amnesty, Bhumibol, Bribes, castration, constitutional monarch, Crown Prince Vajiralongkorn, Father of the Nation, Hua Hin, King of Thailand, King's Palace, Ladyboys, Land of Smiles, lese majeste, Maha Vajiralongkorn, Nelson Mandela, Pattaya, Pillow talk, Protest movement, Protests, Royal Birthday, Rural masses, Suthep Thaugsuban, Thailand, The King never smiles, Tourism, Travel, Uncategorized, Urban elite, Yingluck Shinawatra | Permalink.